When it comes to security, a lot of people see it as a top priority especially when selecting door locks for commercial businesses. Choosing the best locks for your doors depend on whether a door is exterior or interior because each door​ requires different locking mechanisms entirely. There is a broad range of commercial locks to choose from, and they are quite affordable as well. They provide an extra element of security, privacy, and peace of mind. Before you decide which to buy, first take the time to weigh the pro’s and con’s to determine which is the right choice for you. Here are the top 7 best commercial locks to keep the burglar away. The term dead is used on this lock because it does not contain springs and it provides the most security on commercial doors. It also has a single-cylinder and double-cylinder deadbolt. The single is operated with a key from the outside and with a turn button on the inside, and a double is left hinged with a key on both the inside and outside. This Kwikset deadbolt lock features a smart key cylinder for quick re-keying, and it can be operated with a key on both sides. It comes with a deadbolt and a fully adjustable latch to fit all standard doors. A favorite by lovers of the deadbolt with very high ratings. 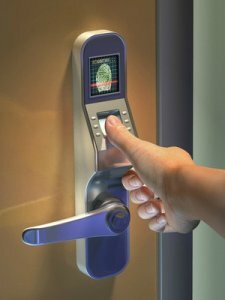 Keypad locks are used for both convenience and advanced commercial security. It can also be used to replace any standard deadbolts on exterior doors. It comes with an anti-theft rolling code feature which ensures the same code isn’t used twice. It is highly rated by customers. Technology has never been better with a lock that uses fingerprint recognition. It comes with the latest biometric entrance technology which can replace most deadbolt locks without drilling an extra hole. It can be configured to suit either right or left swing doors and comes with two backup keys. Mortise locks are a convenience for security and mainly used on different types of commercial doors, including storm doors. The lockset is flat, with a rectangular box which fits into the recess in the door with keyhole, knobs and two faceplates as well. The deadbolt functions by a turn of a inside knob, and the latch functions from either side of the door. This Electronic Touch pad is a very basic option which replaces almost all standard door locks and knobs. It needs no extra wiring for its installation, any averagely skilled contractor can fix it. It comes with two backup keys and is ideal for commercial properties. This is a secure and value-price option, which works mainly with left hinged doors. It can be installed on any existing deadbolt and is ideal for retail stores, offices or private access areas.